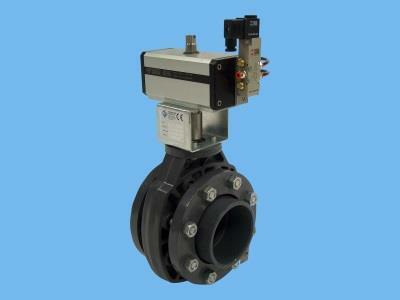 The Envalve butterfly valves are designed to function as a valve or a control valve. The valves are made of PVC and have an EDPM cuff, which is resistant to many aggressive substances. The valves are also available with a VITON® cuff. With electric or pneumatic drive, which can be controlled remotely. In order to operate the PVK butterfly valve, the valve shaft is coupled to a pneumatic drive engine. The drive engine has a 24 VAC power supply control valve. On request, control valves can also be supplied with 230 Volt. The drive engine can turn to 2 sides and is controlled by the voltage that comes from the control valve. Specifications and benefits of a butterfly valve.